I was once told Summer internship is meant to identify what one want to and not want to pursue as job responsibilities in future as one kick starts his/her professional career. 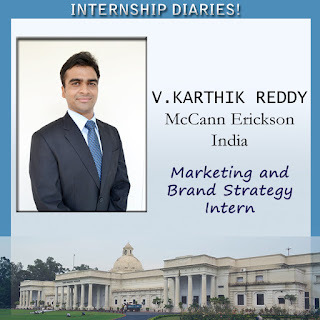 Keeping that in mind I embarked my journey as Marketing and Brand Strategy Intern at McCann Erickson India in the month of May 2015. From our campus three students (including me) got selected for McCann. We were put under the Strategic arm of MRM Worldwide, McCann WorldGroup . This department is meant to create brand strategies and digital media solutions for its clients. The office environment was energetic and designed to let the creative juices flow around. We had flexible working hours but at times it would stretch quite late as well. The best part of my internship at McCann was working on different projects every week. It kind of helped kill the monotonicity of a corporate job. Fortunately, we were directly involved in the live assignments at MRM Worldwide, McCann WorldGroup. It also meant that we didn’t have the luxury to work at our own pace but to meet the deadlines given by McCann’s clients. The first deadline that we got on our first day itself was of 4 hours. It helped us adjust to the demands of the job at hand and within a week we got used to the work pressure. Another enriching experience working at McCann was that most of the clients of MRM Worldwide, McCann WorldGroup are big brand such as Airtel, American Express, General Motors, Lufthansa, IFFCO etc., which meant we were involved in making real time business strategies for such huge brands. Following were few of the assignments we were involved during our stay at McCann. I would like to take this opportunity to thank my mentors whose encouragement, guidance and support enabled me to perform my job to the best of my abilities. The innumerable knowledge sessions about the Industry and MRM Worldwide, McCann WorldGroup in particular was enriching. The constant feedback and daily interactions ensured our stay at McCann fruitful. In the end, my advice to juniors is look for opportunities where the job profile is enriching and mentor-ship is supportive.